With the release of his highly anticipated debut solo album 'Practised Bravado' (2017), featuring world class drummers Thomas Lang (Paul Gilbert) and Dennis Leeflang (Bumblefoot), Theo van Niel Jr. showcases his particular wide ranged skill set as a musician and has put his name on the map of the international music scene. 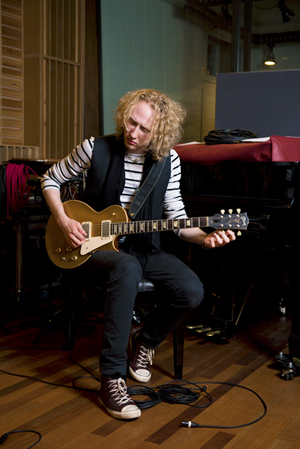 With his unique approach and mastery of many different musical styles, he is acclaimed to be one of the top guitar players of the Netherlands. As a son of a record store owner Theo had no shortage of hearing good music. '' During my youth I would be hearing the best music there was day in, day out..'' recalls Theo. Inspired by a Johnny Winter record, he first picked up a guitar at age eight and soon would be putting in the many hours it needs to master the instrument. It didn't take long before he would be sharing the stage with many known local musicians..
After graduating at the Rotterdam Music Conservatory, he was already performing with a wide variety of bands. Most notably is his role as lead guitarist and co-writer for Mojo Man, a well received and successful 9-piece blues rock formation. The selftitled debut album 'Mojo Man' (2015) received favorable reviews, with many critics praising Theo's guitar playing. ''With the album 'Practised Bravado' he dropped off a beautiful business card.